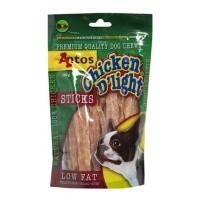 Antos Chicken D'Light Stick Dog Treat 100g is a pack of delicious and fully natural treat that your dog won't be able to resist. Made from 100% chicken, these tasty sticks contain are low in fat but contain lots of protein to ensure your dog stays in a good health. Free from preservatives, colourings or artificial flavourings, these chicken treats will provide your dog with something a bit different that they will definitely enjoy! Re-sealable bags to keep your treats fresher for longer.